If you’re going to travel for fall break, I recommend checking out a new country. You will have more time to really get to know a place instead of dashing off for a quick weekend getaway. You could also travel in your host country, but I find it easier to save those trips for weekends since you can just hop on a train. Don’t get me wrong, there is a lot of value in exploring your host country — after all, you’re there for 3 months so you should be an expert on your country by the time your program ends. That being said, traveling for fall break helped me develop a deeper appreciation for Paris, and I couldn’t wait to sleep in my own bed when I got back because Paris has become my home away from home. So, how did I plan my trip for fall break? I have always really wanted to go to Greece, but I knew that I would want to visit Athens and an island. It would have been too much to cram in one weekend, so I figured it would be best to go for fall break. The first step is finding flights. I have been using Google Flights to try and get the best deals. Once I figure out which airline is the cheapest, I go to the airline’s official website. It was going to be ridiculously expensive to fly in and out of Athens, but with some research, I discovered that I could fly into Athens and fly out of Corfu, one of the Greek islands, for about half the cost. We didn’t plan to visit Corfu, but we let the inexpensive flight prices dictate where we went since there was more flexibility during fall break. Next step is booking a place to stay. Check out main attractions that you want to visit and try to book a place nearby to minimize walking distance. This will allow you to spend more time being a tourist and less time relying on transportation. I have stayed in both hostels and AirBnbs, but for this trip it was cheaper to stay in an AirBnb. Our AirBnb hosts were very welcoming and gave us tips and places the see. Once you have all of your reservations booked, start looking into things that you want to see. I like to use Pinterest and Fodor’s to get an idea of what the main attractions are. I also use Viator to find unique tours. 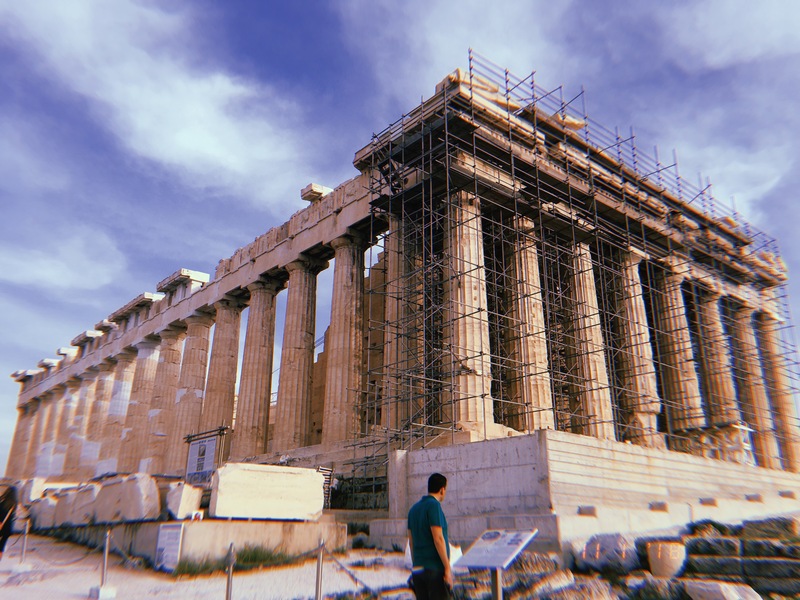 We booked an amazing food tour in Athens! I learned that it is best to make a list of must-see sights and then have a backup list in case you finish your main list. I have also tried planning things out hour-by-hour, but I decided that I would rather be more spontaneous and allow myself the freedom to wander a little bit more. Pro tip: the best part about being an IES Abroad student is that you have a student card, use it! You can get free or reduced admission to most museums as an EU student. I saved 20 euros at Acropolis by presenting my student ID. To recap: book your flights (do it as early as possible! ), find a hostel/AirBnb nearby activities, and research things to do. Planning a trip can be daunting at first, but if you break it down into those steps it will be more manageable. Check out the photos to see how my trip to Athens and Corfu turned out!